Today, I have absolutely nothing to offer up here of any substance – but I guess that’s what qualifies this post as a PonderToot, right? I was outside pulling a few weeds a few minutes ago and realized that my nose started feeling funny in an itchy, sniffly sort of way. Mildly annoyed, I began to tell myself that I should go inside lest I acquire a full-blown hay fever attack, or sinus headache, or hives, or, or, or…Oh, I get it. A sniffly nose could be a sly excuse to go back inside and pick up that great book I just started this morning. I am pretty good at catching myself in the act of trying to slide out of a good day’s work, but I don’t always love these realizations. You can’t really tell from the photo, but these little piggies are sporting very sparkly, twinkly toenail bling. 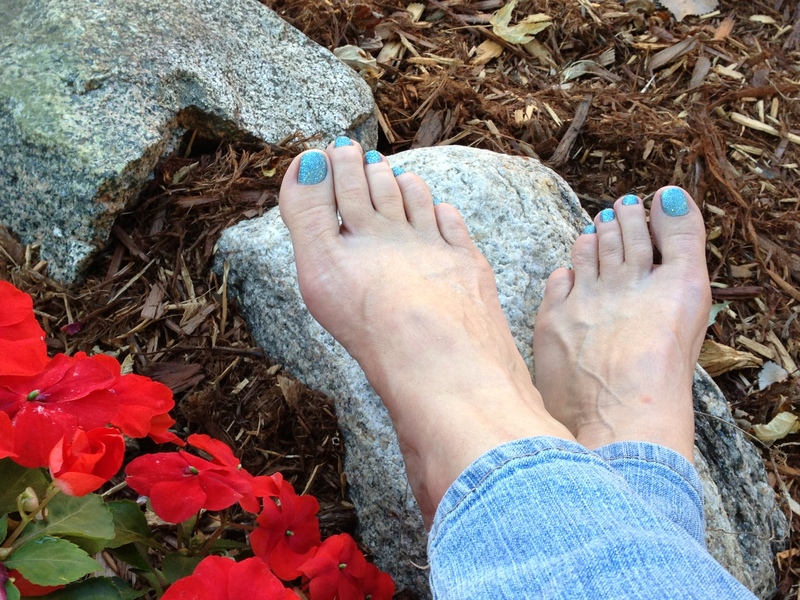 I had forgotten that I had just had a pedicure the day before (my occasional self-treat to have my “hooves done”, as I say to my husband) and was surprised to see these little bursts of glittery blueness when I looked down. Oh, God…I am much too easily amused. So then I realized that I didn’t notice my annoying sniffly nose when I was gazing at my twinkly toes. Ha! I decided to make a game out of pulling five weeds, then looking at my toes (toes, in general, are very interesting things to ponder and no, I do not have a toe fetish. But really, aren’t they really interesting things? They are very odd.) Even better, toes with sparkly blueness on the tips of them make me laugh. Every single time. Pull five weeds. Look down. Laugh. Repeat. I love dessert. By dessert, I mean the thing that is usually eaten after a meal and is typically sweet. However, in my world, dessert is a word for a delicious little nugget, scoop, or slice of unusual goodness; it does not necessarily need to be sweet, and who in the world made the rule that it can only be eaten after dinner? Not anyone I would care to know. I recently came across these tiny square dish/bowl-like things and was instantly smitten. They are so danged cute! I bought three sets of four, with visions of serving delightful little portions of goodness to future guests. Well, I haven’t gotten around to sending out any invitations yet, but I did make the little delights shown above, placing ten of the twelve into the freezer (before careful application of the whipped cream and berries) for future indulgence. The other two were consumed by my husband and me later in the evening, and yes, they were delicious! I crushed a bag of organic gingersnap cookies in the food processor and then simply combined some of the crushed gingersnaps with a bit of homemade ginger honey to make a tiny crust. (I have the remaining cookie crumbs stored in the freezer, ready for a future tiny square dish adventure). Refrigerate these pretty little treats for at least an hour or two before serving. 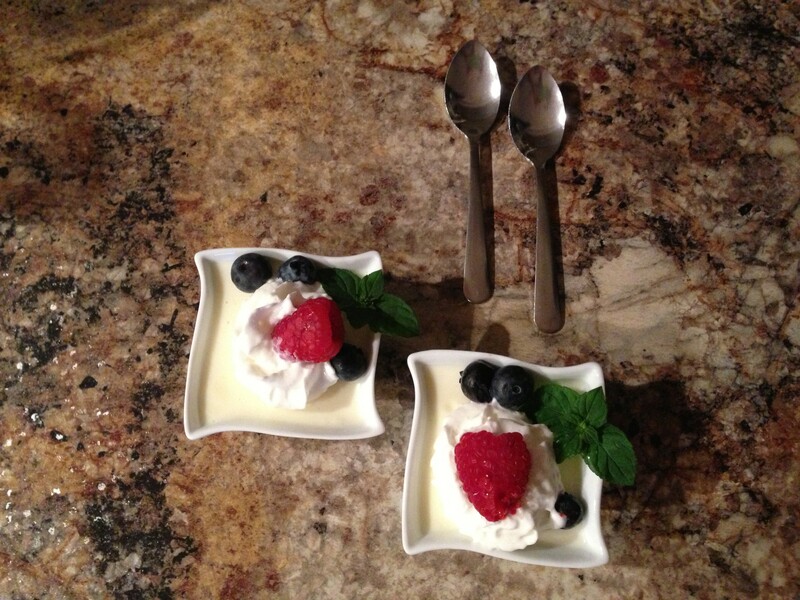 Just before serving, I added a small dollop of whipped cream, a few fresh berries, and a mint leaf from the garden for an extra bit of pretty deliciousness. My husband and I agree that there will always be a place at our table for tiny treat desserts. I have been imagining all sorts of uses for the tiny treat square bowls. Have any ideas that you’d like to share? Last Sunday, my youngest son and I decided to drive from the Twin Cities area to a small town in Wisconsin to visit the Crystal Cave, located in the town of Spring Lake. “E”, as I shall refer to him because I have not acquired permission to out him on this blog, (and also I might as well acknowledge my sadness that I have not yet requested nor received an informed consent to publish the most adorable cave-tourist photo of him EVER) had expressed an interest in spelunking, gemology, jewelry-making, and, oddly enough, spending time with his mom. That last item especially got my attention. Our paths as mom and son have not always been easy. He was the somewhat unlucky innocent bystander in his dad’s and my divorce at age six, and did not always have the cushiest childhood circumstances with which to launch into adulthood as seamlessly as he deserved. In spite of this, he has grown to be a young man of high intelligence, understated and clever sense of humor, and a sincere desire to move forward in life and contribute something to the world. And oh, yeah…he has his mom’s good looks (that’s a joke; he resembles his dad and is very handsome). We had a great time at Crystal Cave. 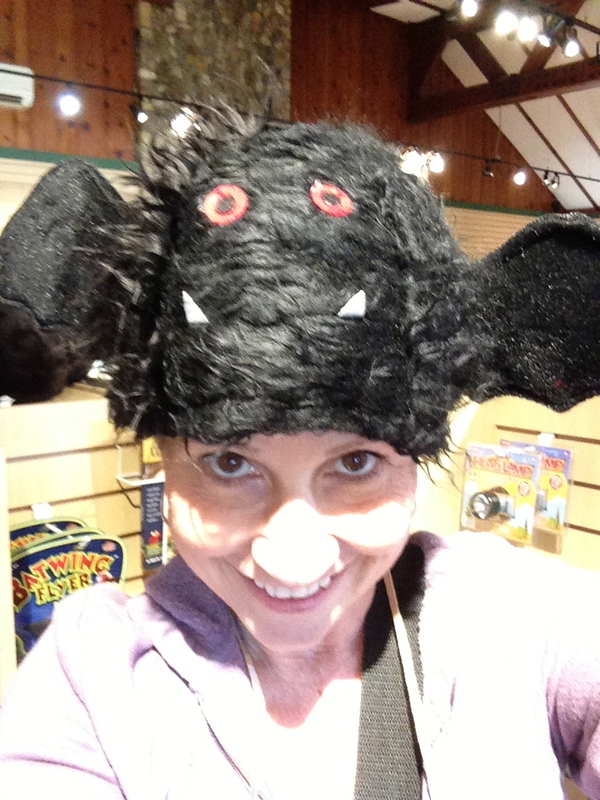 We saw bats – and we love bats. We also saw stalactites, stalagmites, the “Ballroom” where two underground weddings have actually taken place, and experienced complete darkness when the guide turned off her flashlight. Our courage was truly impressive, especially when compared to the reactions of the terrified 4 and 6 year-old children standing next to us in the blackness. Later that evening after our return and when “E” left to go back to his apartment, I reflected on the day’s conversations during our drive to the cave. Here’s what I noticed: our conversation was relaxed, thoughtful, mutually respectful, rich…topics such as wellness, reproductive rights in politics, parenting, our family ancestry, dating, career choices, dogs, spirituality, death and dying, funny Youtube videos…were discussed with mutual and gentle curiosity of each other’s opinions and experiences. When did this kid grow up? Even more surprising – when did I lose my reputation as the Village Idiot? That day’s experience illustrated that as I relax my role as sometimes hovering, worrying, hyper-vigilant Mom, I can more clearly see my son as the grown up and independent wonderful young man that he has become. He doesn’t need me to instruct, admonish, prod, shape…he needs me to listen when he speaks, to hold his experiences and opinions as important, and to respect our differences. A funny thing happened on the way to the cave: I saw my son as a man. My name is Kathy, and I am a native Californian transplant who has been living in Minnesota for nearly 30 years. Primarily, I am a lover of life, and have what I experience as a rich one: I work as a psychotherapist in private practice, have two grown sons and four grandchildren, and live with my favorite work and playmate in life (Steve, my husband), and two companion parrots. I love to ponder my inner landscape and outer environment, and invite you to ponder along with me.